Five years ago, the World Summit on the Information Society (wsis) established the Internet Governance Forum (igf) with somewhat ambitious goals. It would serve as a global platform for multi-stakeholder dialogue on “key elements of Internet governance in order to foster the sustainability, robustness, security, stability and development of the Internet”. The stakeholders include representatives from government, industry, the technical community and civil society, all of whom come together periodically to discuss the Internet’s future. Even hackers and hacktivists show up at igf meetings, and they get a chance to speak. The latest igf meeting, which ended recently in Nairobi, pulled together 2,000 delegates—from bureaucrats and businessmen to campaigners for free speech. All of this would make it seem that this multi-stakeholder concept, unusual and, perhaps, unique, is the best way to govern the Net. But the rub is that igf is primarily a talk shop—and one of the reasons governing the Internet is becoming increasingly difficult. So although IGF champions—and there is no dearth of them—may extol this heterogeneous mix and see it as the right model for the success of the Internet, others are less sanguine about its future. For one, governments are moving towards stricter control of the Net as the world has seen during the so-called Arab Spring uprising in Tunisia, Egypt and Yemen. Even the US has been guilty of clamping down on its freedom in the wake of the WikiLeaks case (see ‘Battle for the Internet’, Down To Earth, March 1-15, 2011) and sometimes in the cause of protecting the intellectual property rights of its big business. So how does the world go about governing the Net in keeping with the dynamic nature of the medium with its amazing potential for promoting economic and social development and human rights? There appears to be no clear way forward. Proposals for reform did not meet with general approval at the Nairobi meet. For instance, the proposal by the IBSA countries, India, Brazil and South Africa, for a new UN body for Net governance (within the UN structure) was challenged by several critics who saw it as an attempt at policing. The result was some heated debate but no movement forward on governance reform. On the face of it there does not seem to have been anything overtly risky in the IBSA proposal. Nor did it seek to replace the IGF but rather to supplement it. 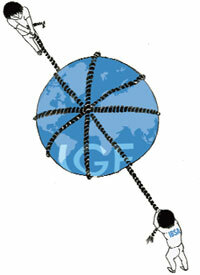 The main elements of the proposal was that the new body should be given the task to develop and establish international public policies with a view to ensuring coordination and coherence in cross-cutting Internet-related global issues; integrate and oversee the bodies responsible for the technical and operational functioning of the Internet, including global standards setting; address developmental issues related to the Net; undertake arbitration and dispute resolution where necessary and be responsible for crisis management. In fact, these proposals are based on the guidelines prepared by the working group on Internet governance in 2005. Did the antagonism to the IBSA proposal have something to do with the way it was put forward as the group that need to take the leadership role in Net governance issues? Whatever the reason some participants were extremely critical of the proposal but for what appeared to be a misunderstanding of the logic for reform. Byron G Holland, president and CEO of the Canadian Internet Registration Authority (CIRA), saw it as an attempt to weaken the multi-stakeholder model, ignoring the fact that a new process or institution for governance is vitally necessary for the simple reason that some areas of Internet policy need a body which can take decisions at a global level, such as those that ICANN makes for DNS. At the end of the day, the IGF, according to its constitutional brief, or the Tunis Agenda, talks about the need for such a process that lead to “enhanced cooperation from all stakeholders”. Can the Net really continue to function in the current way in an uncoordinated fashion through policies set by individual governments and powerful business interests? If the Net is to work for everyone, then there has to be a transparent process in which all stakeholders can contribute to policy-making. There is, as the Association for Progressive Communications (APC), an international network and non-profit organisation championing access to a free and open Internet, says plenty at stake on Net governance that cannot be left to ad hoc measures. In a document, distributed at the Nairobi IGF, APC points out: “Many important technical decisions about Internet architecture are being made right now—decisions that will have consequences for decades. At present, policy choices are being made largely without the input of civil society and without sufficient consideration of the public good.” It calls for a rights-based approach to Net policy through “innovative thinking, a new paradigm”. Governments need to think afresh on the issue.